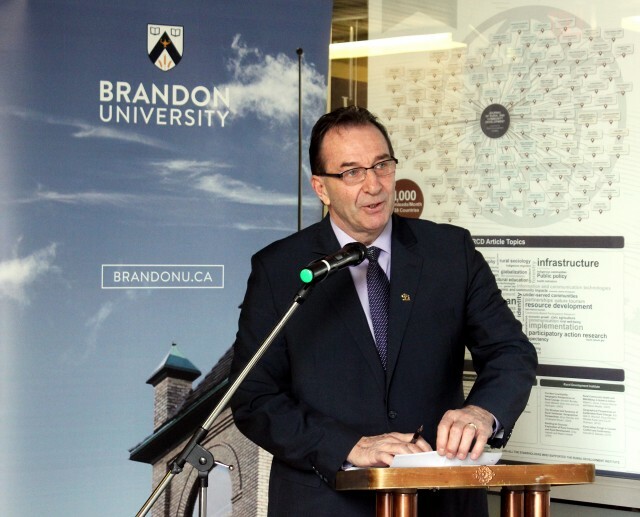 Manitoba Agriculture Minister Ron Kostyshyn unveils the province's new discussion paper on rural development at an event at Brandon University on Monday, Jan. 18, 2016. BRANDON, Man. – The Rural Development Institute (RDI) at Brandon University (BU) is helping to spur conversation on the future of economic development in rural Manitoba. The Province of Manitoba unveiled a new Rural Economic Development Strategy discussion document on Monday outside of the RDI office. The Institute is one of the partners in the Strategy’s steering committee, contributing insight gathered from more than 25 years of research. 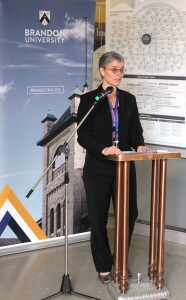 Kim Lemky, Acting Director of the Rural Development Institute, introduces speakers at an event on Monday, Jan. 18, 2016, to unveil speaks about the province’s new discussion paper on rural development in Manitoba. “The Rural Development Institute played an integral role in encouraging the development of this strategy, which reflects themes from an RDI conference in 2014,” said Kim Lemky, the Institute’s Acting Director. The discussion document will guide the creation of a strategy for economic development in rural Manitoba. Appointed in 2015 by Agriculture, Food and Rural Development Minister Ron Kostyshyn, the steering committee includes representation from the fields of business, Indigenous economic development, education and all levels of government. They are forming a plan that will focus on the key factors that encourage growth in Manitoba. The Association of Manitoba Municipalities (AMM), Manitoba Chambers of Commerce (MCC) and Economic Developers Association of Manitoba (EDAM) have all provided input for the discussion document. The discussion document can be found at gov.mb.ca/agriculture/rural-communities/economic-development/pubs/discussion-paper-rural-econ-strategy.pdf. With a population of more than 475,000 people, rural Manitoba accounts for about 35 per cent of the province’s gross domestic product (GDP), based on research by RDI. In comparison, about 30 per cent of Canada’s GDP comes from non-metro areas countrywide.